Here are a couple pregnancy charts to help you track and celebrate your pregnancy. Congratulations! So you are finally pregnant. You are filled with joy and high expectation of motherhood. But the journey is just beginning. There are many weeks of internal and external changes ahead of you and it is important you understand everything that is going to happen from now till you give birth to that lovely baby girl or boy. 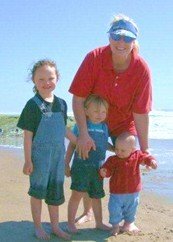 According to a 1990 Harvard study called The length of uncomplicated human gestation (Mittendorf et al), normal pregnancy is actually 41 weeks and one day long. 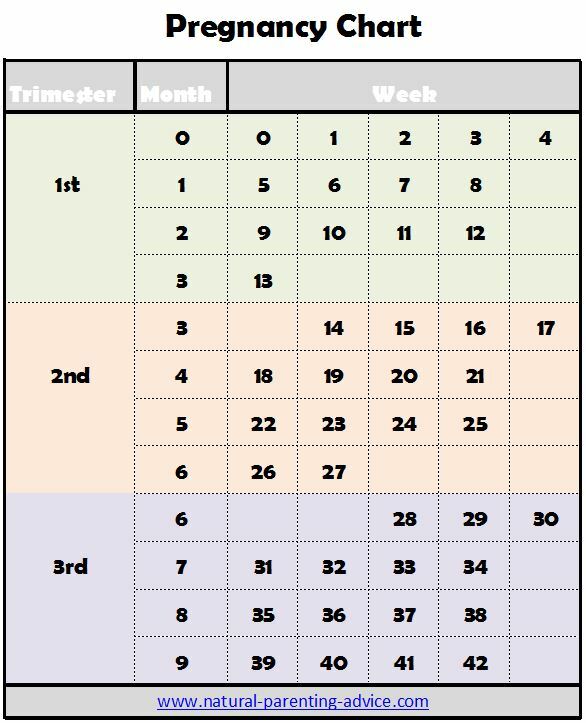 There are three trimesters: the first has a duration of 13 weeks, the second 14 weeks and the third lasting 14 weeks (assumes 41 week pregnancy) . Figuring out precisely where you are in your pregnancy can sometimes be confusing. Read on to discover the answer to some intriguing pregnancy timing questions and pregnancy charts. Midwives and doctors start counting pregnancy from the very first day of your last menstrual period even though it is obvious you weren’t pregnant then. The first day of your last menstrual period is usually about two weeks before you ovulated and subsequently conceived your baby. The count is started from there because of the fact most women don’t know exactly when they ovulated, however, most of them are aware of the time their last period started and ended. Your doctor counts 280 days from the very first day of your last menstrual period to arrive at your due date. That is exactly 40 weeks. However, your due date is just an estimate as only 5 percent of babies are born exactly on their due date. Though there are no official definitions, the trimesters are generally considered to be about 3 months each with little variations. The first trimester starts when you get pregnant. You graduate to the second trimester as soon as you turn 14 weeks pregnant. The 3rd start the day you turn 28 weeks pregnant. It is, however, important that you know how the trimesters work and the kind of changes to expect in each trimester. 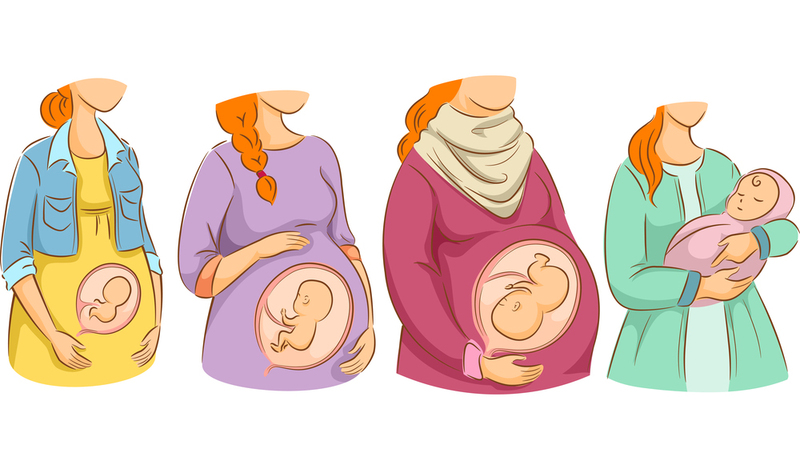 After the process of fertilization and implantation, the baby is at first just an embryo: the fragile layers of the cell from which all the other organs of the body will develop. At this stage, the baby grows quickly and she is soon about the size of a kidney bean and constantly growing. At this stage, the heart is beating fast and the intestine is forming. Your budding daughter or son’s eyelids, earlobes, nose, and mouth are also taking shape. At the onset of the second trimester, babies weigh about 1 ½ ounces and are about 1 ½ inches long. Unique but tiny fingerprints are now in place and the heart now pumps 23 quarts of blood a day. As the trimester progresses, the baby’s skeleton begins to harden from rubbery cartilage to bones. She has also developed the ability to hear at this stage. You are likely to feel flutters and kicks if you haven’t already. You may want to print out the pregnancy charts above so you can track your progress! By the start of the third trimester, babies weight roughly about 2 ¼ pounds. They can now blink their eyes, which now spots lashes. And their normally wrinkles skins has started to smooth out as they put on what we call baby fat. This stage also witnesses the development of fingernails, real hair, and toenails, while adding billions of neurons to their brains. Your blossoming angel will spend her final weeks in utero, putting on lots of weight. 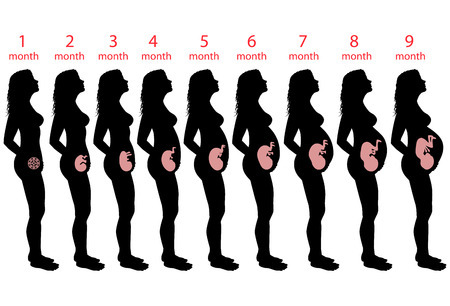 Your baby will be more than 19 inches long and weighs roughly 7 pounds at full term. So the wait is almost over and your pregnancy is on the final stretch of it countdown. You are excited and at the same time anxious as to what to expect. This is normal. You should be packing your bags and also wrapping up your week-by-week pregnancy chart and painting nursery instead. With some luck, your baby will be on time and around 40 weeks in the 3rd trimester, you can expect to give birth.